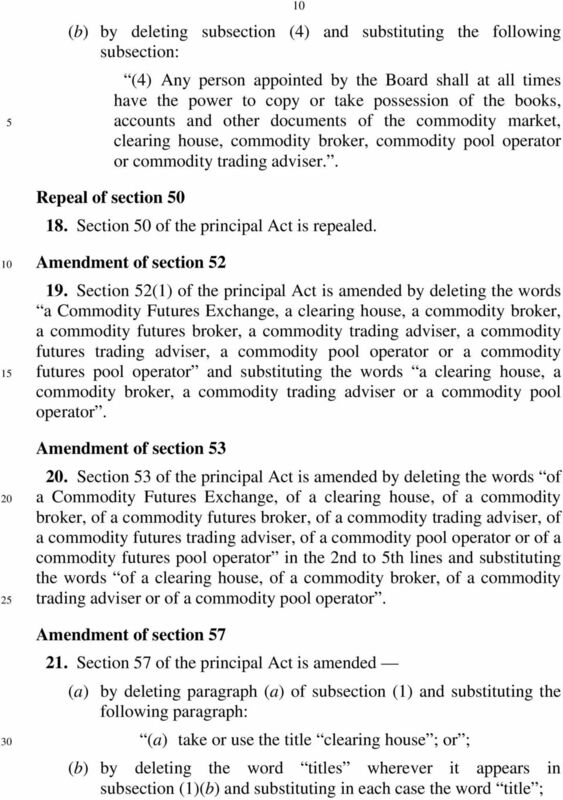 Download "Commodity Trading (Amendment) Bill"
8 35 8 futures pool operator in subsection (1)(b) and substituting the words, a clearing house, a commodity broker, a commodity trading adviser or a commodity pool operator ; (b) by deleting sub-paragraph (ii) of subsection (1)(b) and substituting the following sub-paragraph: (ii) a duty to enlarge or extend the scope of his audit of the business and affairs of a commodity market, a clearing house, a commodity trading adviser or a commodity pool operator; ; (c) by deleting the words a Commodity Futures Exchange, a clearing house, a commodity futures broker, a commodity trading adviser, a commodity futures trading adviser, a commodity pool operator or a commodity futures pool operator in the th, 26th and 27th lines of subsection (1) and substituting the words a clearing house, a commodity trading adviser or a commodity pool operator ; (d) by deleting the words a Commodity Futures Exchange, a clearing house, a commodity broker, a commodity futures broker, a commodity trading adviser, a commodity futures trading adviser, a commodity pool operator or a commodity futures pool operator in subsection (2) and substituting the words a clearing house, a commodity broker, a commodity trading adviser or a commodity pool operator ; and (e) by deleting subsection (4) and substituting the following subsection: (4) Where the Board is of the opinion that the whole or any part of the costs and expenses of an auditor appointed under subsection (1)(a) should be borne by a commodity market, a clearing house, a commodity broker, a commodity trading adviser or a commodity pool operator, as the case may be, the Board may by order in writing direct that the market, clearing house, broker, trading adviser or pool operator, as the case may be, pay a specified amount, being the whole or part of the costs and expenses within the time and manner specified in the order..
12 35 12 reason only of his doing anything which is merely incidental to another business; ; and (d) by deleting sub-paragraph (iii) of subsection (4)(a) and substituting the following sub-paragraph: Amendment of Schedule (iii) who is a commodity broker, commodity trading adviser or commodity pool operator, by reason only of the entering into by him of any specified transaction or class of transactions;. 24. 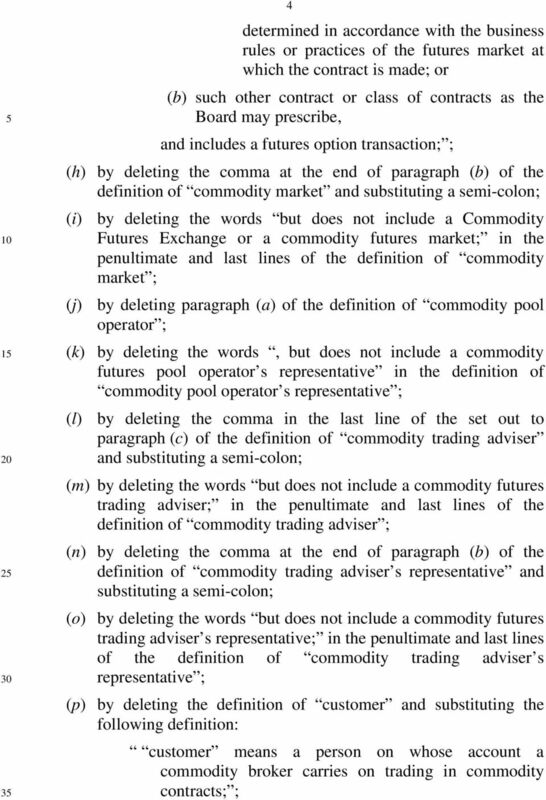 The Schedule to the principal Act is amended (a) by deleting sub-paragraph (d) of paragraph 1; and (b) by deleting paragraph 2 and substituting the following paragraph: 2. In this Schedule, accredited investor means (a) an individual (i) whose net personal assets exceed in value $2 million (or its equivalent in a foreign currency) or such other amount as the Board may prescribe in place of the first amount; or (ii) whose income in the preceding 12 months is not less than $0,000 (or its equivalent in a foreign currency) or such other amount as the Board may prescribe in place of the first amount; (b) a corporation with net assets exceeding $ million in value (or its equivalent in a foreign currency) or such other amount as the Board may prescribe, in place of the first amount, as determined by (i) the most recent audited balance-sheet of the corporation; or (ii) where the corporation is not required to prepare audited accounts regularly, a balance-sheet of the corporation certified by the corporation as giving a true and fair view of the state of affairs of the corporation as of the date of the balance-sheet, which date shall be within the preceding 12 months; (c) the trustee of such trust as the Board may prescribe, when acting in that capacity; or (d) such other person as the Board may prescribe..
19 19 (b) any right of appeal that has accrued before the date of commencement of this Act under subsection (4) of that section. 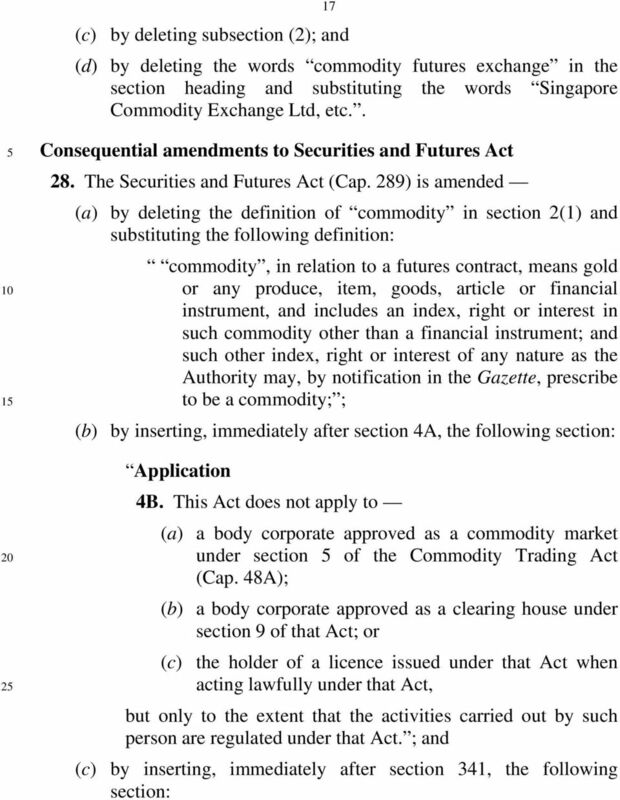 (4) An auditor appointed under section 23 or 27(6) of the principal Act in respect of a Commodity Futures Exchange or a commodity futures broker and who has not completed his duties under that section by the date of commencement of this Act shall, unless the Monetary Authority of Singapore otherwise determines, continue to carry out his duties as if he were appointed by the Monetary Authority of Singapore under section 9 of the Securities and Futures Act (Cap. 289) in relation to that Exchange or person; and the provisions of the Securities and Futures Act shall apply as if he were so appointed. (5) The Minister may by regulations prescribe such further transitional and savings provisions as he may consider necessary or expedient within 2 years of the date of commencement of this Act. 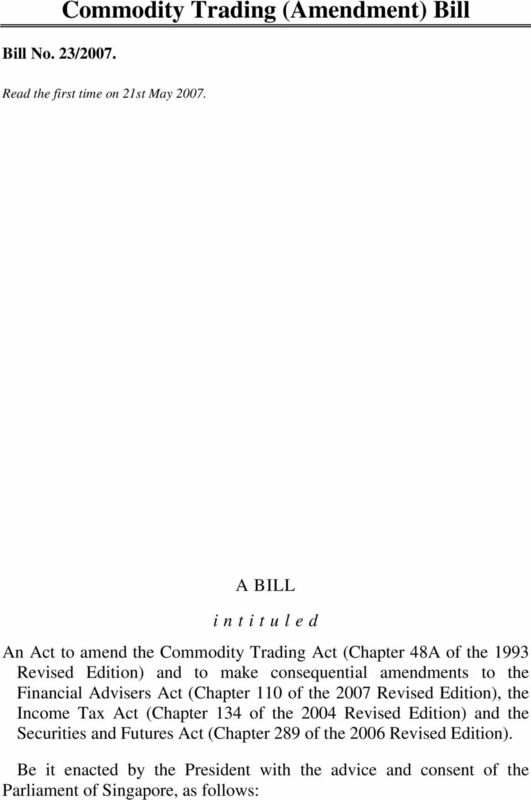 EXPLANATORY STATEMENT This Bill seeks to amend the Commodity Trading Act (Cap. 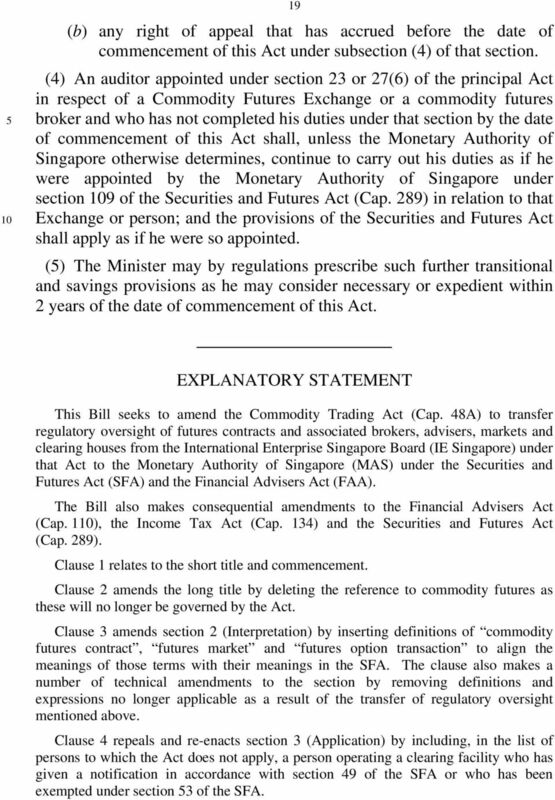 48A) to transfer regulatory oversight of futures contracts and associated brokers, advisers, markets and clearing houses from the International Enterprise Singapore Board (IE Singapore) under that Act to the Monetary Authority of Singapore (MAS) under the Securities and Futures Act (SFA) and the Financial Advisers Act (FAA). 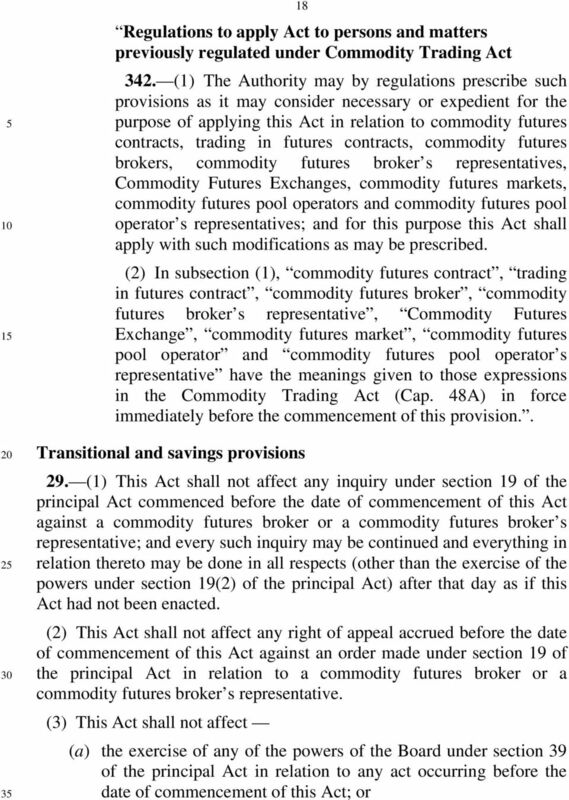 The Bill also makes consequential amendments to the Financial Advisers Act (Cap. 1), the Income Tax Act (Cap. 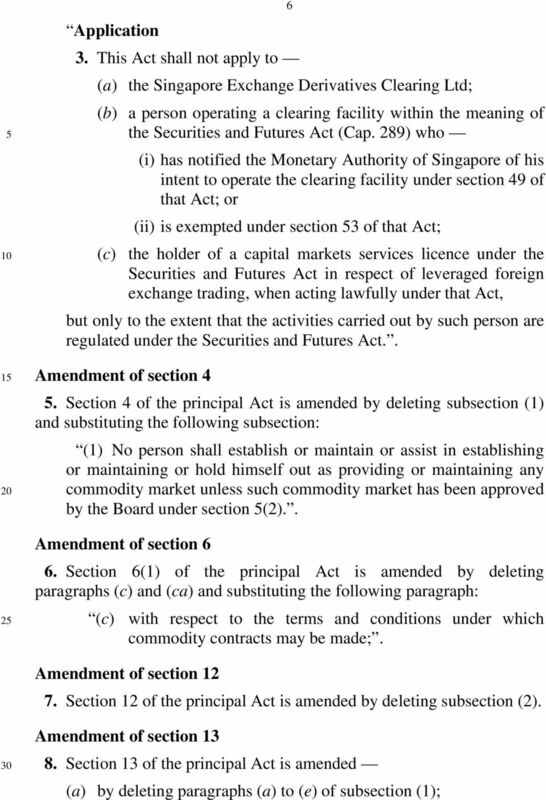 134) and the Securities and Futures Act (Cap. 289). Clause 1 relates to the short title and commencement. 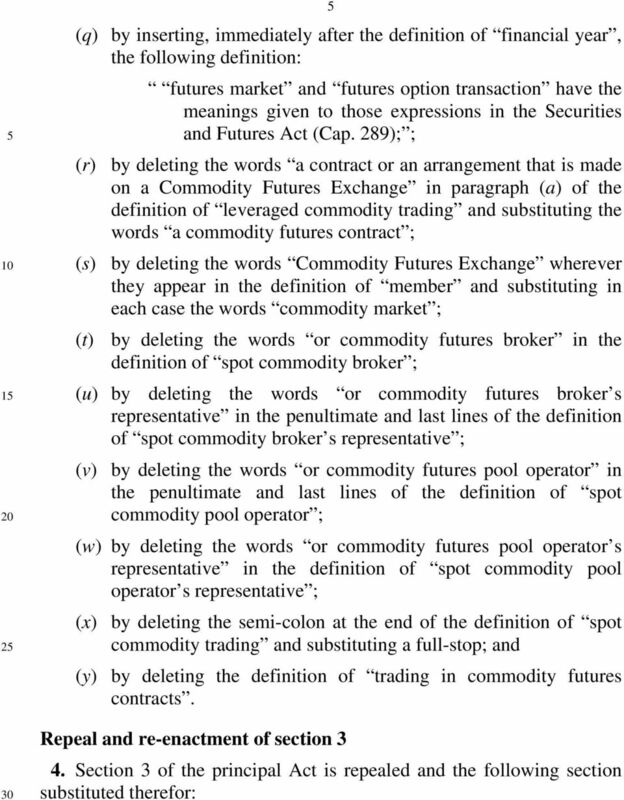 Clause 2 amends the long title by deleting the reference to commodity futures as these will no longer be governed by the Act. 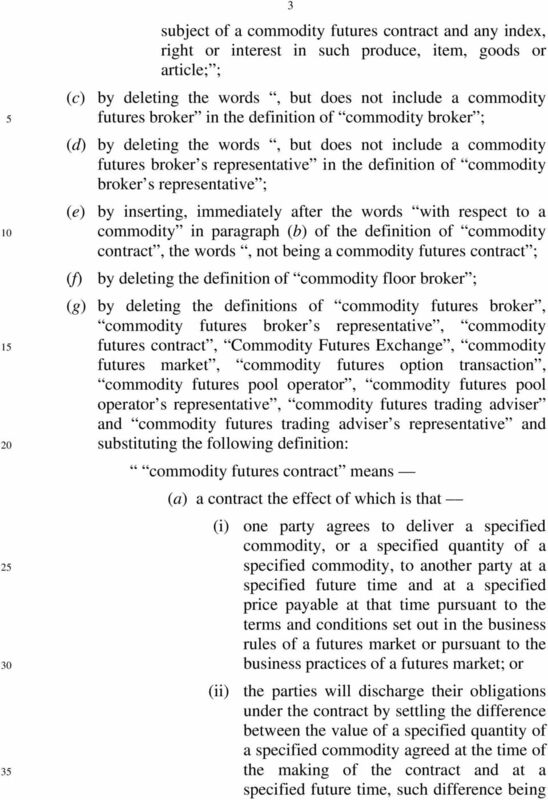 Clause 3 amends section 2 (Interpretation) by inserting definitions of commodity futures contract, futures market and futures option transaction to align the meanings of those terms with their meanings in the SFA. 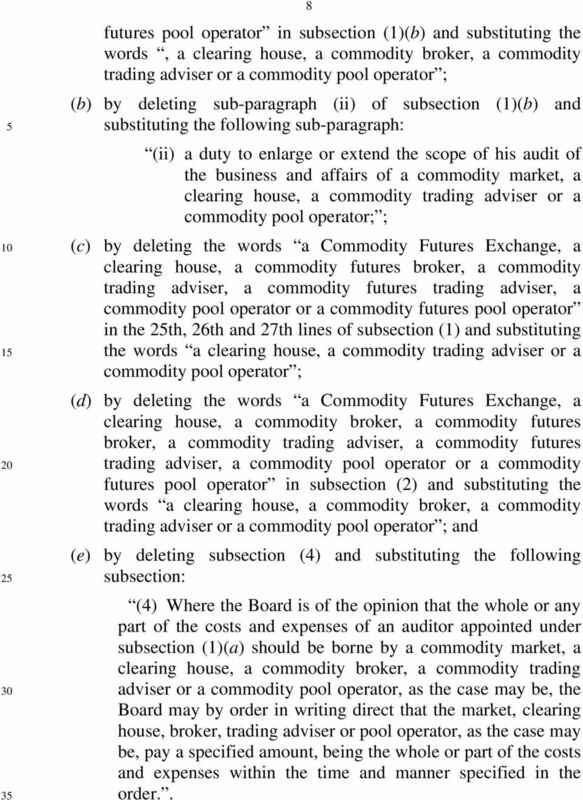 The clause also makes a number of technical amendments to the section by removing definitions and expressions no longer applicable as a result of the transfer of regulatory oversight mentioned above. Clause 4 repeals and re-enacts section 3 (Application) by including, in the list of persons to which the Act does not apply, a person operating a clearing facility who has given a notification in accordance with section 49 of the SFA or who has been exempted under section 53 of the SFA. 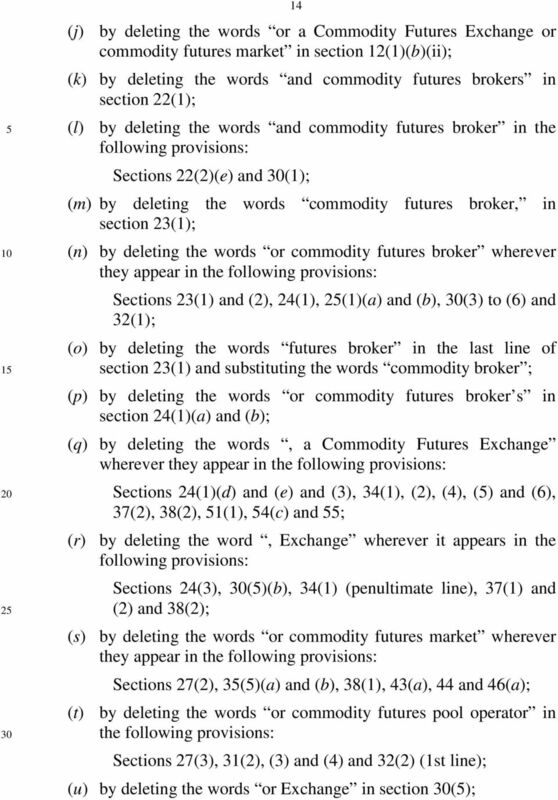 20 Clauses 5 to, 17, 19,, 21, 23 and make technical amendments to various provisions of the Act by removing provisions and expressions no longer applicable as a result of the transfer of regulatory oversight mentioned above. 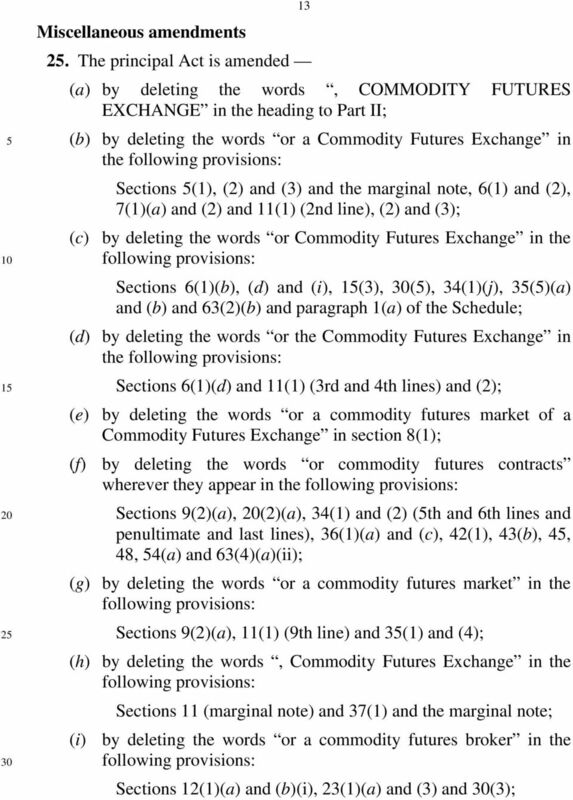 Clauses 16 and 18 repeal sections 39 (Review of Commodity Futures Exchanges disciplinary action) and 50 (Convicted persons liable to pay compensation to person who traded in commodity futures contracts with him), respectively, as a Commodity Futures Exchange and trading in commodity futures contracts will no longer be regulated by the Act. 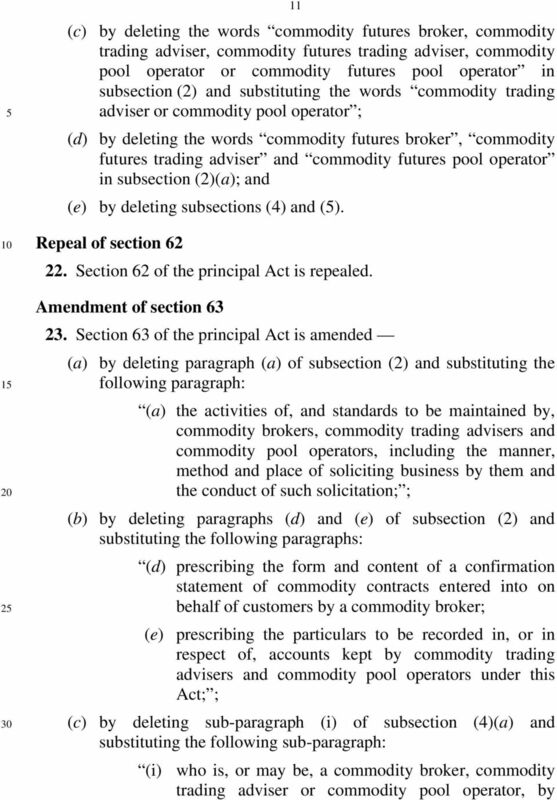 Clause 22 repeals section 62 (Commodity contracts not gaming or wagering contracts) as the same rule is found in section 5 of the Civil Law Act (Cap. 43). 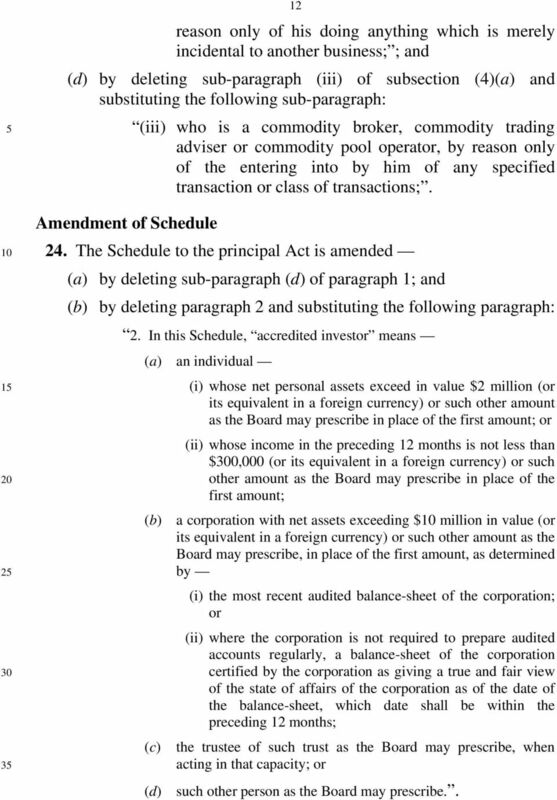 Clause 24 redefines the term accredited investor in the Schedule (which sets out exemptions from Part III of the Act relating to licences) to provide that an individual whose net assets exceed $2 million or whose income in the preceding 12 months is not less than $0,000 may be considered an accredited investor, to provide that a trustee of a prescribed trust may be considered an accredited investor, to enable IE Singapore to vary the minimum amount of net assets for which a person may be considered an accredited investor, and to enable IE Singapore to prescribe other persons as accredited investors. 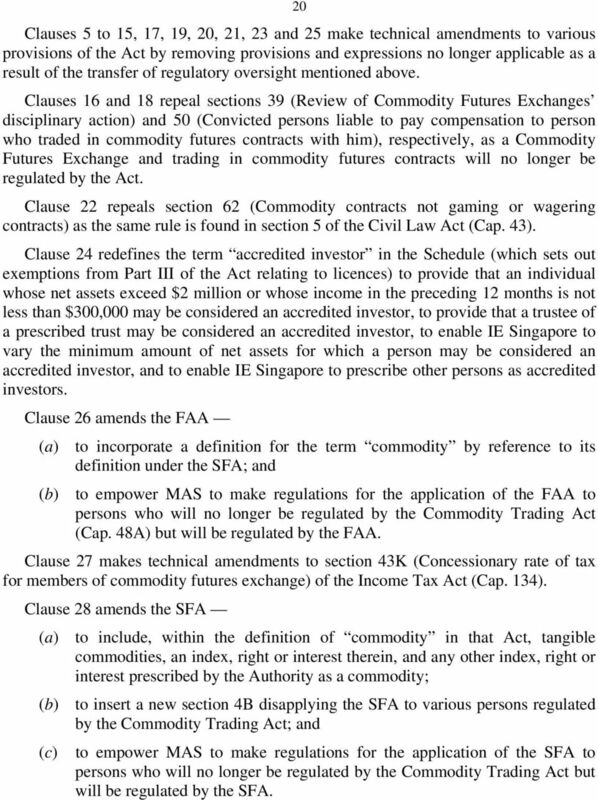 Clause 26 amends the FAA (a) to incorporate a definition for the term commodity by reference to its definition under the SFA; and (b) to empower MAS to make regulations for the application of the FAA to persons who will no longer be regulated by the Commodity Trading Act (Cap. 48A) but will be regulated by the FAA. 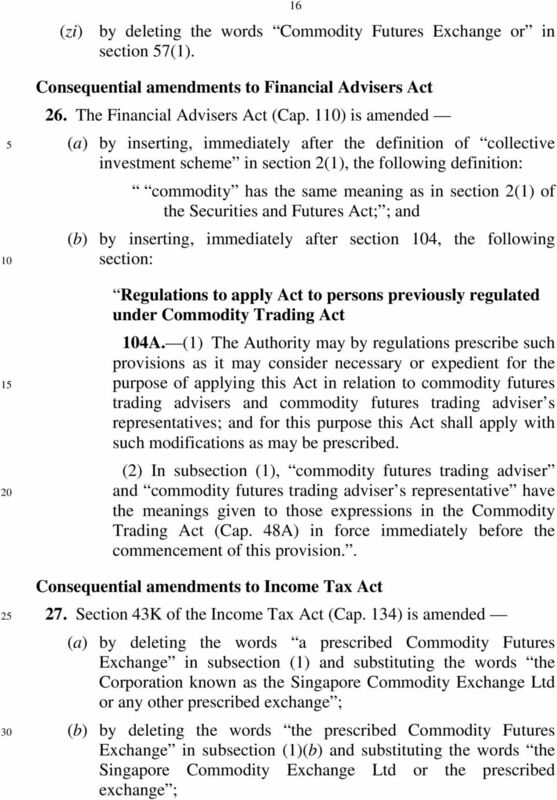 Clause 27 makes technical amendments to section 43K (Concessionary rate of tax for members of commodity futures exchange) of the Income Tax Act (Cap. 134). 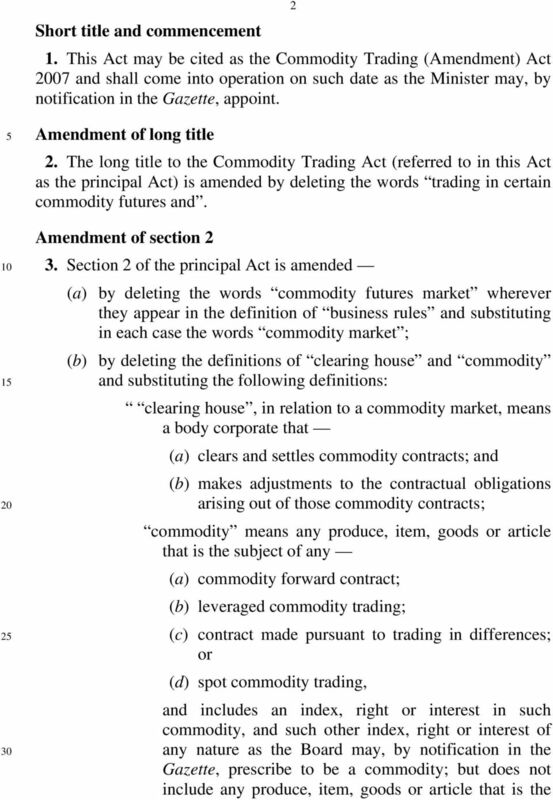 Clause 28 amends the SFA (a) to include, within the definition of commodity in that Act, tangible commodities, an index, right or interest therein, and any other index, right or interest prescribed by the Authority as a commodity; (b) to insert a new section 4B disapplying the SFA to various persons regulated by the Commodity Trading Act; and (c) to empower MAS to make regulations for the application of the SFA to persons who will no longer be regulated by the Commodity Trading Act but will be regulated by the SFA. 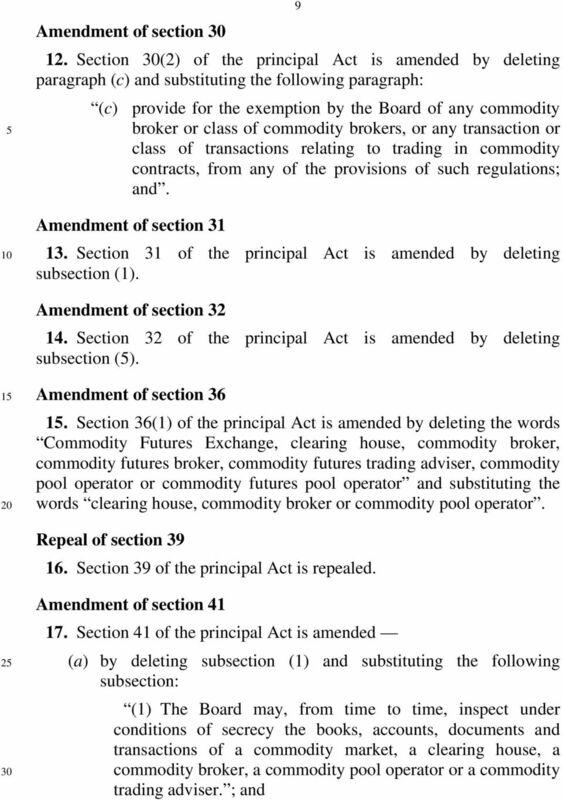 21 21 Clause 29 prescribes transitional and savings provisions for the Bill. Inquiries under section 19 instituted before the commencement of the Bill against persons no longer regulated under the Act may be continued. 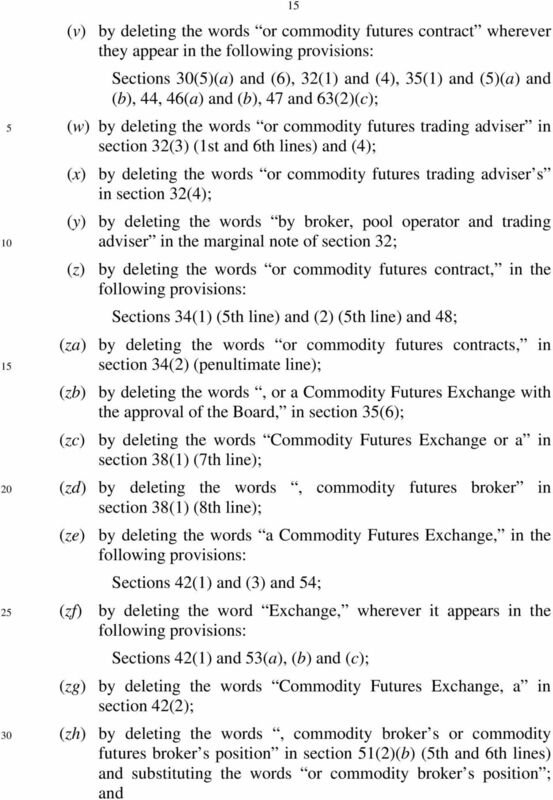 IE Singapore may continue to review a Commodity Futures Exchange s disciplinary action or take disciplinary action against a member of the Exchange under section 39 if the event concerned occurs before such commencement. A right of appeal that has accrued before such commencement may continue to be exercised. An auditor appointed under section 23 or 27(6) for a person no longer regulated by the Act may continue to perform his duties as if he were appointed under the SFA. The Minister may also prescribe other transitional provisions within 2 years from the commencement of the Bill. EXPENDITURE OF PUBLIC MONEY This Bill will not involve the Government in any extra financial expenditure. Retirement Fund (Amendment) 1 A BILL. i n t i t u l e d. An Act to amend the Retirement Fund Act 2007. A BILL 1 i n t i t u l e d An Act to amend the Anti-Trafficking in Persons and Anti- Smuggling of Migrants Act 2007. [ ] ENACTED by the Parliament of Malaysia as follows: Short title and commencement 1. Moneylenders (Amendment) 1. a bill. i n t i t u l e d. An Act to amend the Moneylenders Act 1951. 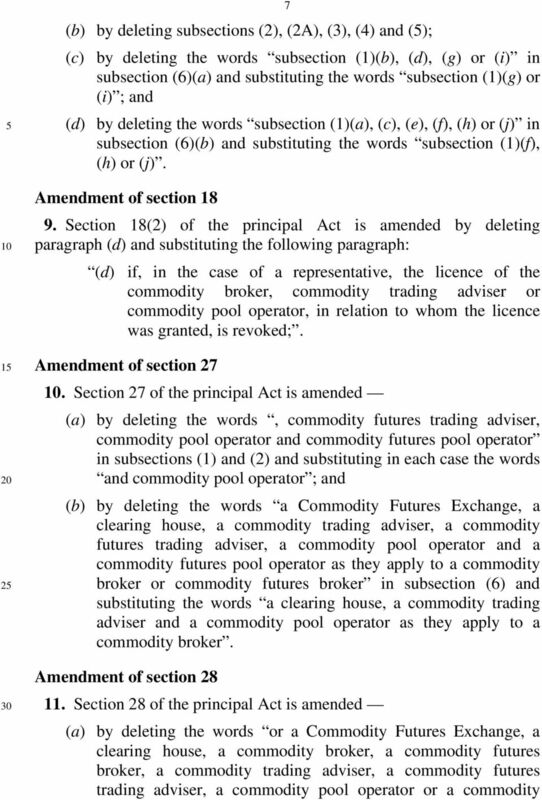 CHAPTER 292 THE GAMING AND POOL BETTING (CONTROL AND TAXATION) ACT. Arrangement of Sections. 8. Closing of Central Motor Tax Account and payment into the Fund of amounts of rate support grant. Number 29 of 1997 LOCAL GOVERNMENT (FINANCIAL PROVISIONS) ACT, 1997 Section 1. Interpretation. ARRANGEMENT OF SECTIONS 2. Regulations, orders and directions. 3. Retention of car tax by local authorities. Funds in the Cayman Islands Investment Fund Regulation The law is simple and straightforward. Not all investment funds are regulated under the law. Not required to be registered are close ended funds (i.e. Number 28 of 2012 QUALIFICATIONS AND QUALITY ASSURANCE (EDUCATION AND TRAINING) ACT 2012 ARRANGEMENT OF SECTIONS PART 1 Preliminary and General Section 1. Short title and commencement. 2. Interpretation.